Taste test: These chips had the same very thick cut and fairly wide ripples as the other McCoy's potato chips, but these are part of McCoy's line of special flavors. Special didn't come cheap, as this medium-size bag cost about four dollars, raising my expectations. The chips tasted pretty good, with a flavor that did sort of emulate the taste of spare ribs, but it just wasn't an outstanding or particularly strong taste. 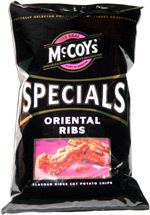 There's usually a ton of flavor on McCoy's chips, and though these had a lot of flavor, they didn't have a ton. Boneless spare ribs set a very high standard in terms of taste, and these just weren't quite up to the task. Smell test: Good, mild sweet barbecue smell.